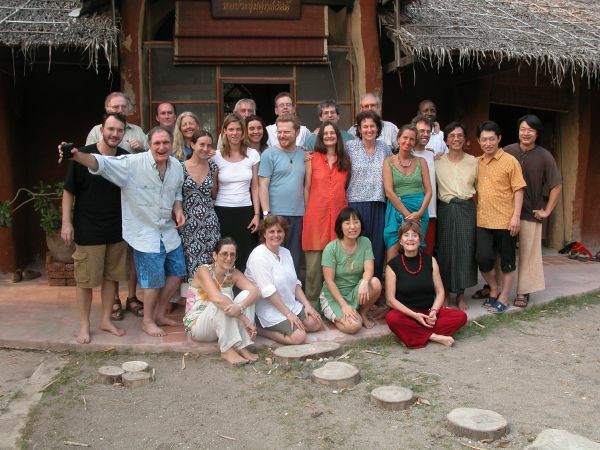 On 14th December 2006 a seminar was held to celebrate the anniversary of Wongsanit Asharm on alternative perspectives for the future Thai society. Two approaches were discussed, namely Community-Culture approach and Dhammic Socialism. The participants were from Wongsanit Asharm, Spirit in Education Movement (SEM), College of Social Management, NGO workers, grassroots leaders and general public. The seminar was aimed to search for new political alternative models based on local cultures and the Buddha?s social teachings. The seminar was opened by Ajarn Sulak Sivaraksa?s remark on the current political issue in Siam. He criticized the last P.M. Taksin?s government particularly from Buddhist perspective on political ethics. He said, ?The government in the last 5 years was the worst Siam ever had. The Prime Minister neither respected grassroots people nor observed morality in governing the country. The leader must hold ethics, wisdom and skillful means. They have to serve the suffering people, not satisfying their own interest.? Then Mr. Chatchawan Tongdeelert and Mr. Sanan Chusakul, two veteran social activists, presented the community cultural approach. They explained the meaning of community-culture approach and how to establish the desirable future society from this perspective. Then the Dhammic Socialism was presented by Mr. Pracha Hutanuwatr. He explained Bhikkhu Buddhadasa?s fundamental thinking on which the dhammic socialism was based. The assumption of community cultural approach toward the desirable Thai society is that each community had its own culture, economic system, administration and autonomy. The community culture is important for the society because it keeps social stability. The community cultural approach values the morality and the sustainability as the most important elements. So villagers neither destroy the natural resources nor take advantage from one another. They produce mainly for local consumption, not for accumulation or commercial purpose. Even now community cultures in Thailand are maintained by the villagers? respect to the nature. There are many ceremonies to express their gratitude to the nature. Siam is still able to keep many different local cultures. They are not yet completely destroyed because the force of so-called ?development? has not totally changed the mode of production in the rural area until only recently. There even was a proposal that the community cultural plurality should be regarded as the national identity. The central government should decentralize administrative power to local communities and secure community rights because the villagers should have a chance to take care of their own livelihood, village and environment. The villagers would make careful use of the natural resources because they are the sources of life. The resources would be used to produce only for the survival of the local people, not for massive production that serve consumerism. Consumerism is a cause of lack, exploitation and environment destruction. Pracha talked about Bhikkhu Buddhadasa?s hypothesis of the Dhammic Socialism. Dhammic Socialist principle includes all beings in this universe, not only human being into consideration. If we want to establish a desirable society, we should make it ?dhammic?, i.e. founding it on dhamma or the nature. According to Pracha, there are four basic principles by which Buddhadasa Bhikkhu formed his theory of Dhammic Socialism. Everything in this universe is developing toward the enlightenment: Everything in this universe is developing toward enlightenment, no matter it is alive or not. Pebble and man are included. It is the natural law. Nothing can infringe the law. The enlightenment is the end of the journey for every being. Hence we and all beings are brothers in this point of view. We must be kind and never take advantage from anything. Man has a capacity to turn instinct into wisdom: Human beings are different from animal because we can change instinct into wisdom. Our wisdom and thinking capacity enable us to use dhamma to solve problems which occur mainly from the conditioning of mind. All beings in this universe work in a socialist manner: ?Socialism? in Buddhist understanding means working cooperatively, selflessly and not taking a surplus. Everything does not need surplus for the existence. Taking the surplus is selfish and unnatural action. If one takes the surplus, others will lack and suffer. On the contrary, it is contentment and moderation that are our nature, leading to peaceful livelihood. Politics should be based on dhamma (nature): Dhamma and politics is the same thing. Politics is the management a large number of people to live together happily without trouble and coercion. Politics should follow dhamma which is the nature and the law of nature. We can use any kind of government but it must base on dhamma. To implement the dhammic socialist ideology, Pracha suggested that morality or spirituality is the most important element in politics and leadership. The leader should support the ethical social values and stop unethical ones. Education should realize such values. Students must not be encouraged to study only for selfish purpose. They should learn how to help or develop their society in the ?socialist? way. The mass communication has to present the true values for the society. It is better if they present information that is helpful for social development. We should set up the alternative communication when the mainstream media cannot fulfill the task. After the seminar, the thinkers of the two approaches agreed to do further study and exchange the findings. They hope that the studies in the alternative perspectives on social analysis and development will reverse the deadly trend propelled by capitalist-materialist-consumerist model as we suffer now.